learning environment for children ages 3 to 5 years old. 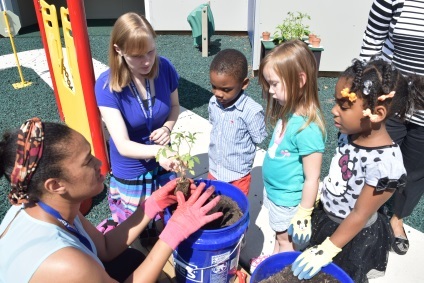 "(Winston-Salem, NC) – Forsyth Tech has opened an Early Childhood LAB School at 2410 Oak Grove Center on the college’s Main Campus in Winston-Salem that is designed to provide Early Childhood Education students with onsite supervised, hands-on teaching experience and instruction. The program is open to Forsyth Tech faculty and students as well as the general public and is now accepting applications. The LAB school has been created for children ages 3 to 5 with a maximum capacity of 15 children. The half-day program runs Monday through Friday from 8 am to noon, giving children up to four hours of participation in an enriching and well-planned environment. The best-practices program is designed to stimulate growth and development, meeting the individual needs of each child. The daily curriculum includes indoor and outdoor activities, art, music, math, science, language and literacy, dramatic play, gross and fine motor coordination, and technology. Nutritious snacks are also provided. There is a one-time registration fee of $75 and tuition is $300 per month per child. Forsyth Tech Early Childhood Education interns are carefully supervised and coached by certified teachers who possess strong backgrounds in early childhood education and who mentor the students in how to administer quality, nurturing care in an environment that is developmentally appropriate, stimulating and comfortable. Parents are welcome to interact with their children via the Observation Room or Parent-Resource Corner, which is stocked with age-appropriate books, games, technology, book packs and other academic materials that are available for parents to check out. The Parent-Resource Corner was created through a $23,000 grant from the Kate B. Reynolds Foundation and is designed to develop literacy pathways with innovative school-to-home and home-to-school learning options for parents and their children. The LAB school schedule will align with Forsyth Tech’s academic calendar year schedule. For more information, contact Karatha Scott at 336.734.7974 or kscott@forsythtech.edu.